Welcome! 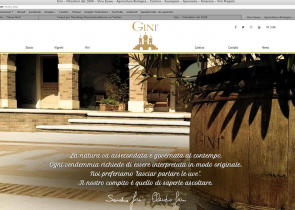 You are currently browsing the new website of Gini - winegrowers since1600. This site means to take you within our cellar, to relate to you our history, a history about ancient lands and traditions. Now you can explore our vineyards discovering the differences and peculiarities of our plots in Monteforte (in the Soave Classico zone) and Campiano (in the Valpolicella doc zone). We want to convey the passion for our work through the narration of how we work. In the section “Wines” you can find our complete range of production, from our “Soave Classico Gini”, the selection of our finest Soave Classico vineyards, and the two crus “La Froscà” and “Contrada Salvarenza – Vecchie Vigne”, to the Sparkling wine, leading through the Sauvignon “Maciete Fume”, “Sorai”, the Pinot Noir “Campo alle More” and of course the Recioto di Soave “Col Foscarin” and the special selection “Renobilis”. Soon the section “Where to find our wines” will be online. This section is devoted primarily to horeca to enable clients to meet with those distributors closest to them, but also to individual clients with a section devoted to the most important wine shops. Stay tuned for all the news about the world of wine, about our products and our processes.